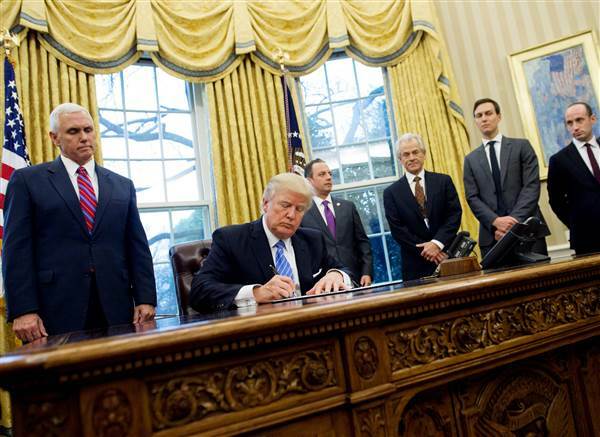 President Trump in his first full week in office, started by issuing the reversal of Barack Obama’s signature trade deal, pulling away from Asia. A signature theme of his campaign, reversing Obama’s TPP deal. The TPP deal or The Trans-Pacific Partnership is a trade agreement which was designed to lower trade barriers between the member countries. Australia, Singapore, Canada and Japan were amongst the 12 state members. The idea was that if everyone brought down taxes on exported goods, U.S. companies would pay less for imports — while benefiting from cheaper labour overseas. TPP was an attempt to create a single market for the U.S. and 11 countries that border the Pacific Ocean, including Canada, Mexico, and Chile. The idea was to make goods flow more freely and cheaply between all partners — who together represented one third of global trading. It was a way of President Trump showing he means business, with an act that doesn’t really have a great deal of substance. But allows his supporters to put a ‘feather in their caps’. At least he has delivered on one of his campaign promises. That is true, he did say he was going to do it. Personally, the truth about Trump is as follows; I have no idea what to expect of him and in some ways that is exciting. and it didnt even take 8 freaking years of pointless waiting this time. that said, its probably the last thing he does i feel really great about.